Moving into a new city and settling down is not an easy task. I’ve seen many people asking (dare enough) one-liner questions in OTN and many other forums (most them are a rip-off from so called interview sites) and I replied to one of those questions (long time back) saying that I’ll post about my experience, so here we are. I don’t believe in those one-liner questions like “What is Dense/Sparse?”. After usual introduction John said “Celvin, we have an issue, Let’s see whether you can solve it”. Assured by Mr.Infrastructure’s words (about the backup) I started looking at it. My heart still beating faster. 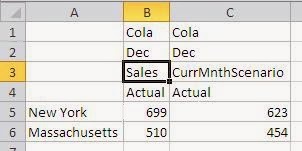 Problem: Values are not showing up correctly for a member which has formula and it is using SUMRANGE. Me (Hugh Jackman) with a laptop trying to crack an issue with SUMRANGE and John (John Travolta) testing whether I can crack it or not. I swear there were no ladies in the room!!!!! The problem was related to XRANGE in SUMRANGE function. @XRANGE(Jan,Dec) works, however not @XRANGE(Dec,Jan) – that evaluates to an empty set. SUMRANGE was written using substitution variables, so I had to change it to get it right. Later after the interview I figured out that there was no need for XRANGE there, anyways let’s continue. Well it is a documented behavior Setting Substitution Variables. To ensure that a new substitution variable value is available in formulas, partition definitions, and security filters, stop and restart the application. All other uses of substitution variables are dynamically resolved when used. Does that mean Smart View can see the updated variable? Yes it can, well here is the proof. Refresh the sheet and you’ll get Nov values. Now let’s change the substitution variable to “Dec”. 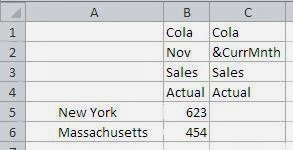 Smart View can still pull the correct variable value however the formula cannot. Now that’s makes our VIth surprise. Why can’t formulas, partition definitions, and security filters look at the same place where reporting is querying for the substitution variable? My requirement is to update substitution variable via batch automation. Challenge here I am facing here is to update weekly variables. Cur variable should be update -5 weeks (5 weeks prior )to current week. For example now it is April 2 nd week so substitution variable cur week should be March first week.we have in period dimension members like jan_week_1,jan_week_2.. etc we are following 4-4-5 distribution.quarter last month will have 5 weeks. Kindly guide me how to achieve this. Any inputs is highly appreciated. I’ve once done this for quarters (take the current month and set Quarters (prior, current and pri prior)). It is going to something similar. Weeks is going to be more complicated. Let me see if I find out what I did at the previous client and post it. Thank you for good articles. Even i have similar requirement on substituion variable requirement..Check current variable and update it to next week correctly…for example current week is April_2_week..maxl should update it to April_3_week…our environment is on windows…so not ablw to figure out how to process this and pass correct variable as parameter to maxl update week variable.